Herbie Paul sucked deeply on one of his Rooster cigarettes, as the two of us stood on the sand and looked out to sea. It had been dark when just half an hour ago we had left Malindi, yet already the dusty streets had been busy with people walking to work. By the time we had reached Gedi and turned off the Mombassa road and driven through the village towards Watamu, the eastern sky was starting to lighten. Smoke from roadside cooking fires wafted through Herbie’s ancient pick up truck, chickens plucked and scraped at the dirty roads, crazily waiting until the very last moment before fleeing our rapidly approaching vehicle. Now with the sun sitting just above the horizon the new day was well and truly under way, as Herbie and I quietly mulled over the days prospects. I love being on the beach at Watamu at first light, its one of my favourite places in the world, especially during the first three months of the year. This is the time of the Kaskazi, the north-east monsoon, which by now will be well established with the deep blue water, marlin water, starting just a few miles out from the narrow cut in the beaches barrier reef. There’s no finer place to sit and drink your morning coffee than on the open terrace at Ocean Sports, chatting away to the skippers and their clients about the prospects for the coming days fishing. “Would the breeze blow in the afternoon; would the bait show; would the marlin rise out of those inky blue depths and take our lures and baits, would we catch a fish today”? Just offshore sit the boats. 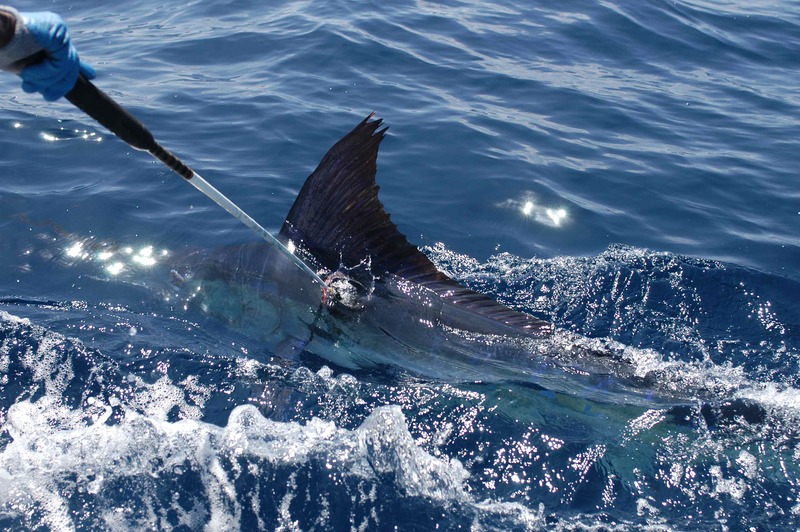 Many of those who had fished the previous day are flying colourful flags from their outriggers, each confirming the capture of a specific species of gamefish; red for a sailfish, blue for a blue marlin, black for a black, green for a striped and orange and white for the elusive broadbill swordfish. The boat crews already are busy, loading the last of the days fuel and readying their boats rods for action. 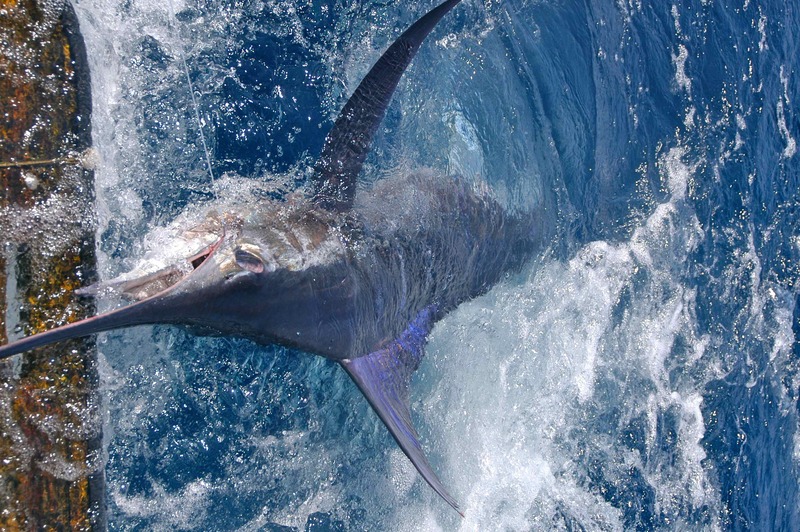 It is peak marlin season on the Kenyan coast, and there are few destinations around the world that offer a better chance for attempting to catch your first marlin than here in Kenya when the Kaskazi is blowing. I finish a second cup coffee, shoulder my camera bag and walk bare footed down the beach to the waiting skiff. Today I am fishing aboard ‘Eclare’, a British built Aquabell, part of the Malindi based Kingfisher fleet, who were founded by Herbie and his wife Catharena. Their son Angus is skipper of Kenya’s number one game boat ‘Neptune’, while at the time this story was written another son, Adrian, is skipper of ‘Tina’. It was my forth trip to Kenya and I was fishing with old friends, Richard Moller at the helm, with Wilson and Lewis on deck. Widely recognised as being one of the top billfish boats on the East African coast, the crew aboard Eclare knew I was desperate to catch my first marlin, and as I stepped forward and greet each of them in turn they boost my confidence by confirming that conditions today are perfect; yesterday that had caught a brace of striped marlin along with some sailfish; today, they say, will be as good-or better. With the engines throbbing Lewis climbs forward and slips our mooring, as Richard slowly manoeuvres us passed the other boats and out through the narrow gap through the reef. Outside the water depths plunges away swiftly, and as Richard gradually increases the engine revs, Eclare raises her bow to meet the gentle oceanic swells that are rolling in from the Indian Ocean. I climb up to the fly bridge to stand beside Richard, enjoying the cooling breeze as we run out as much as the opportunity to look for fish. Soon we see flocks of birds working over the famous banks off Watamu, shoals of kawa-kawa, eastern little tunny, and frigate mackerel, busting the surface beneath them. Wilson puts out a small jig and soon I am reeling in the first fish of the day, a plump kawa-kawa. We catch a few more before moving further on, Wilson removing the belly strips from our fish and rigging them ‘Panama style’ beneath colourful lures. Eventually Richard eases back to 7-knots, trolling speed, and the crew set to work as the well oiled team that they are, rigging our spread of lures and baits; two from the tip of each outrigger, two lower down from the tag line, two off the centre rigger, and a couple more fishing as flat lines from the transom. A couple of brightly coloured teasers are set swimming off the lower section of the outrigger arms to complete our spread, and its time to sit back and wait for a fish. Marlin fishing is very much a waiting game. After almost an hour we are trolling the inshore edge of the Watamu Rips, the marlin hotspot, when with a resounding crack the port tag line suddenly snaps free. I don’t see the fish but both of the crew do, of course, and announce its a sailfish; “suli-suli”! I grab the rod, put my thumb on the spool, and ease the lever right back to engage free-spool, feeling for the fish to return to the lure. Suddenly its back. 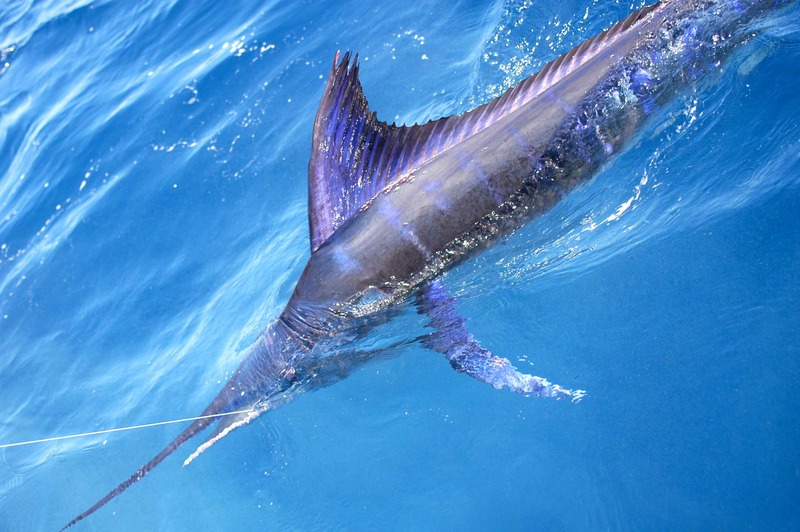 I can both see its bill worrying at the strip bait skipping on the surface and feel it’s tentative plucks at the bait transmitted through the line, sailfish can be frustratingly finicky at times. I free spool the bait back to the fish, watch the fish take, push the lever back to strike, wait for the line to tighten then attempt to set the hook. The fish reacts instantly, tail walking across the surface, it’s magnificent, purple sail glowing in the sunshine; then the line falls slack, it has thrown the hook. “Next time give a little more time at free-spool before you strike,” advises Richard, and we resume fishing. Dejected I sit down to mull over my loss, but not for long. Soon after there’s a splash of white water on the starboard flat line, the rod bends and the reel screams. I grab the rod and strike, no need to free-spool this time the fish has taken the bait and is running, and 50 yards astern a spectacular blue and golden fish takes to the air in a spectacular head over tail cartwheel as it violently shakes its head; a dorado. Fulusi, as they are known in Swahili, are one of the worlds great sports fish, but on a 50lb outfit such as this their sporting qualities can not be appreciated. Fulusi are damned fine eating too, one of the very best, and this fish was consigned to the boats cool bag. By mid-day the word on the radio confirms that today everywhere the fishing had been slow, certainly much slower that yesterday. 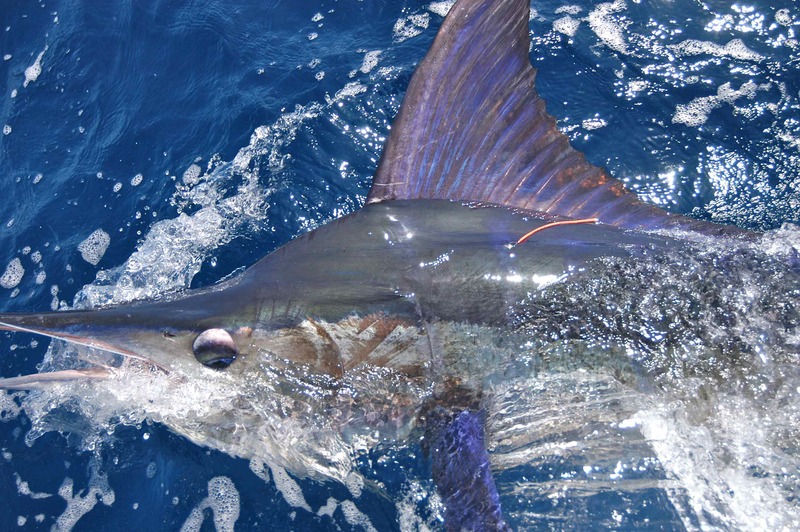 Few marlin had been seen, very few hooked and only one or two released. I was starting to think my marlin would have to wait for another day, it was tempting to run inshore and fish for sailfish or possibly GT’s in a turbulent area known as The Boiling Pot, but we decided to stick to our original plan. A little after mid-day I was sat atop the fly bridge access ladder facing out to sea, chatting to Richard while watching our spread for signs of life. The afternoon breeze was just starting to get going and already had generated enough force to create short waves, through which the lures now skipped and splashed and dived. I saw a flash of colour a few hundred yards off to the right of our spread, at precisely the same time as the crew leapt out of the shade beneath the canopy and started to shout: marlin! It was the first marlin I had ever actually seen alive and swimming, and for a few precious moments I stared mesmerised as the neon blue streak accelerated towards the boat. At first I couldn’t make out the shape of a fish, but as it closed behind the lure fishing of the port tag line I could see its pectoral, dorsal and tail lit up an exquisite lilac blue, its body ablaze with similarly coloured strips. Clearly the fish was looking to eat something, and after a moment or two of hesitation it smashed at a lure. The rod bent, the reel screamed and the fish took to the air, as Richard gunned the boat forward with a burst from the throttles to set the hook. Moments later I watched in despair as the fish greyhounded one way, while the lure flew the other. Yet barely had I chance to evaluate what had happened when again the crew were shouting excitedly in Swahili. Another fish was aggressively attacking the strip bait fishing off the starboard rigger, and as I jumped across the cockpit to grab the rod the line snapped taught, the reel screamed manically and once again Richard drove Eclare forward with a burst of power. I don’t think there was ever any need to set the hooks, I think the fish had done a pretty good job by itself, but I did, once, twice three times, then held on as the fish ripped upwards of two hundred yards of line from the reel on its first run. Then it was airborne, jumping in crazy explosions of white water way astern of us, and still the line stayed tight. I cannot remember too much else about catching my first marlin, as I concentrated all of my efforts into keeping the line tight and turning the reel handle as fast as I could, beads of sweat were mingling with suncream and running into my eyes so I couldn’t see too much anyway. I was told it jumped spectacularly several more times, then finally after what seemed an age Lewis leaned out over the port gunwale and took a firm grasp of the leader and pulled my fish to the boat. I had done it, I had caught my first marlin, a beautiful striped marlin the crew estimated at around 110lb. I could not have been ecstatic had it been a 1000lb blue. STRIPED MARLIN AT THE BOAT! An hour or two later we rose a pack of sailfish. I hooked one, after Remembering Richard’s earlier advice and giving it more time to fully take the bait and turn before setting the hook. Then I watched as the sailfish did what sailfish do best; run and jump, run and jump then run and jump some more. Even as it was leadered alongside the boat that lively fish was still jumping. An hour later I was again seated in the small skiff, being ferried the short distance from Eclare, now back at her mooring, to the beach at Watamu, eagerly anticipating the first frosty cold Tusker beer of the day. Herbie was sat at the bar, his packet of Rooster’s by the side of his beer, a warm smile and an outstretched hand waiting to congratulate me. Of course it was drinks all round, as is the custom when you catch your first marlin. Perhaps we stayed celebrating just a few drinks too late in the night, certainly the pair of us were quiet as we drove through the pre-dawn blackness towards Watamu early the following morning. A few minutes on the beach with a cup of coffee soon cleared my head, and for a moment I stood admiring the flags fluttering gaily at the tip of Eclare’s starboard outrigger. Today I was going marlin fishing!